The daughter of Rep. Maxine Waters (D., Calif.) will collect more than $200,000 from her mother's campaign after its debts are paid off for leading a lucrative slate mailer operation, Federal Election Commission filings show. Karen Waters has pulled in hefty payments from the campaign to run a slate mailer operation after the FEC issued an advisory opinion in October 2004 allowing Waters to run the operation from the Citizens for Waters, her mother's campaign committee. Prior to 2006, Karen ran the arrangement through LA Vote, a state committee in California. Karen is in charge of slate mailers, or endorsement mailers, in which candidates pay Rep. 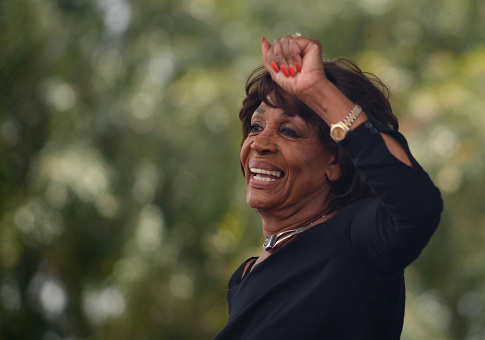 Waters's campaign to appear on mailers that are sent to more than 200,000 residents in the South Central Los Angeles area, where Waters holds a good amount of clout. The mailers contain a sample ballot and quotes of support from Waters. Karen received another $108,862 in payments from her mother's campaign committee during the 2018 election cycle, FEC filings show. The committee additionally reported that it still owes $94,000 to Karen. Once the debt is paid off, Karen will have received more than $200,000 in payments from the committee as marked at the end of the midterm cycle. Gavin Newsom, who was elected governor of California, gave the Waters campaign $27,000 from his own campaign to appear on the slate mailer while Sen. Dianne Feinstein's campaign added $27,000 in slate mailer payments. Newsom and Boxer both previously paid to appear to be on the slate mailers in past elections. Sen. Kamala Harris has also dished out $63,000 to twice appear on the mailers. Harris first made a payment to Waters's committee in 2010 as she was a San Francisco district attorney and running for attorney general in California. Harris made a second payment to Waters in 2016 as she was running for the U.S. Senate. Waters's campaign treasurer did not respond to a request for comment on the payments by press time. This entry was posted in Politics and tagged California, Democrats, Maxine Waters. Bookmark the permalink.